About seven years ago I enrolled myself in the University of Barnes and Noble (UBN). It’s not very well accredited, and the classes are incredibly small; but they have some of the best teachers in the world and it’s far cheaper than any other college you’ll find. 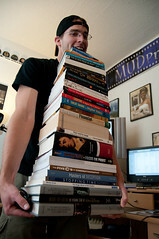 For two years that was how I studied and learned everything I know about photography, animation, and visual effects. The next five years were spent building my business, and I’m pleased to announce that Mud Productions turned 5 years old last February. Lately, however, I’ve been feeling like I need a sabbatical. I’ve lasted for five years on the knowledge I had when I began, but now I want to pour myself into books and learn as much as I can so that I can take my business and my talent to the next level. I think these feelings are very common in any creative profession. We hit a glass ceiling; we can see where we want to be but often feel limited by our experience, money, or knowledge. We fight these feelings until the busy season comes and we are inundated with work. It pays the bills, and we are thankful for the opportunity to do creative work, but that longing to do more and greater things hasn’t gone away. Until we reach the point where we are motivated to make a change, we will keep getting what we’ve always gotten. For me, that point came recently and I’ve decided to enroll in another semester at UBN. 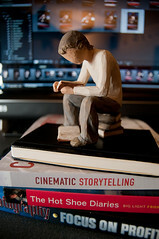 I’ve narrowed my curriculum to three main topics: Finances, Photography, and Filmmaking. Quite possibly the hardest thing about studying at UBN is that you will only get as far as your self-discipline will allow. Just because I have decided to read some books doesn’t inherently mean that I will be a better photographer or businessman. Knowledge is useless until you put it into action. What about you? What do you feel is holding you back from doing what you want to do? This entry was posted in Thoughts and tagged Book Reviews, filmmaking, finances, Photography, sabbatical, studying, Univeristy of Barnes and Noble by Stephen Elliot. Bookmark the permalink.